That house down the street is for sale, I wonder how much it is. I wonder if there are any houses available in that other part of town that is close to my house value. They may be moving my job to the other office, is there any houses in the area worth taking a look at. That place is HUGE, I wonder how much they are asking for that place. And, this is a nice area, we wouldn’t mind living here, is there anyplace we would consider. All questions that might cause someone to need to look up houses for rent or sale. While a agent may be needed to get you to the bargening table, many times no one wants to find a house more than you so why not use the tools at hand. In this case, in your iPad hand. 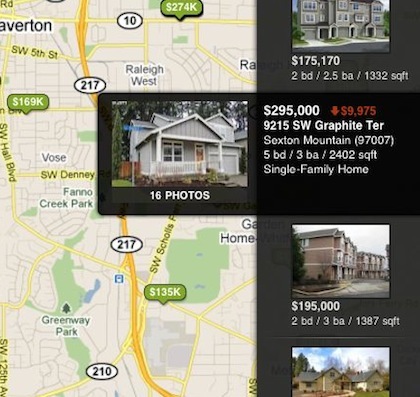 A free app Trulia for iPad brings a lot of ‘looking around’ power to you when you need it. Launching the app, you are given the choice if your looking to buy or rent, then it goes right into what is around you. If your not looking for what is around where you are, there is an extensive search available to use. This is great for looking to an area your interested in to find houses for sale, for rent or recently sold. Narrow your search by house particulars from their quick access options. 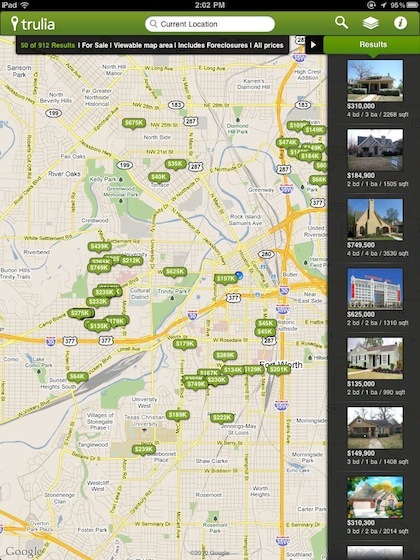 Trulia supports about every town we thought of, just put it in the search. 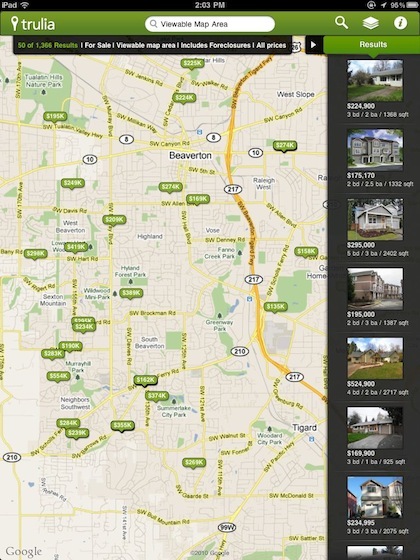 The towns listed down the right are just for quick reference, the Trulia app is not limited to just those showing. The results for a search is similar to viewing the local area. Zooming in and out is done with two fingers and moving around the area is simple with one finger dragging. Trulia lets you quickly go back to the search or see additional information on the area through the upper bar’s quick access buttons. 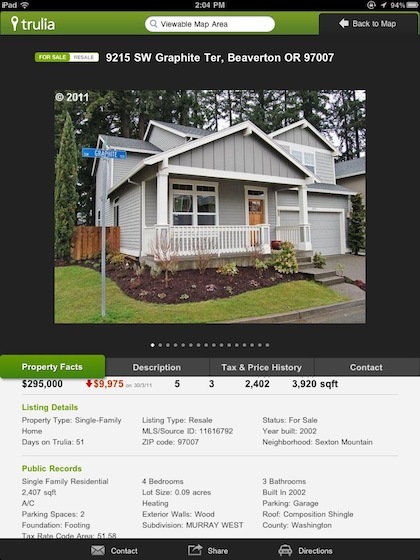 Tap any house on Trulia’s right thumbnail bar to bring up additional information. Tapping the price bubble on the map also results in the same ‘more info’. If the house looks interesting enough to need more info, tapping it from the right bar will result in more details. The ‘Property Facts’ give you how the price of the house has been tracking (changes), details of the listing and the public records. All pretty handy to see how an area is trending and if there are issues. Trulia also makes it handy if you don’t know the area to get directions to that house through the option in the lower bar. 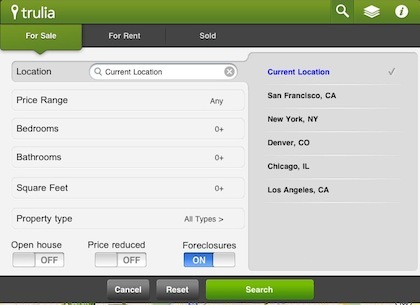 The next tab options are the general description, Tax and Price History and how to contact the seller or agent. Several folks in the office would have found this handy when they moved into the area to get a better idea of what was available as they were driving around without having to call an agent. Trulia’s free app is both handy, and a bit of fun around the office for those chats around houses and values in the area.